Chak 317 - closer to Burewala, Punjab, Pakistan. 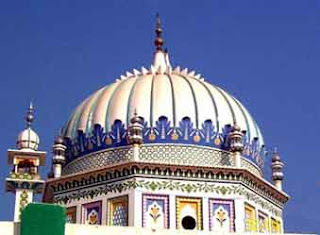 Hazrat Baba Haji Sher (RA) is one of the earliest Muslim Sufi saint in the Subcontinent Indo-Pak. Baba Haji Sher Muhammad Dewan Chawli Mashaikh (RA) have played pivotal roll in establishment of Islam as religion and the area has great significance in this regard as the first Dargah Shareef of sub-continent Indo-Pak is situated here some 17 kilometers away which is a place of religious activities and mental satisfaction.Hazrat Baba Haji Sher (RA) embraced Islam on 27th Ramadan-ul-Mubarak 131 Hijri. Baba Haji Sher Dewan embraced Islam when he was arrested in war between Waliey Sindh and Islamic forces Hazrat Baba Haji Sher Muhammad Dewan (RA) also participated in the war and was detained and brought to Madina as a prisoner where he was very much touched by the preaching of the religion and accepted Islam on the hands of Hazrat Imam Hussain (Razi Allahu Anhu ) and got education from the different Sahaba-e-Ikram and he also performed Hajj there. Hazrat Baba Haji Sher spent some days on the Dargah Shareef of Hazrat Awais Qarni (RA) and got mysticism from there.